Some may know Alissa Arp as a biology professor at SOU, but her talents extend far and wide, and include her passion for Mid Century Modern furniture, and the art of upholstery. Her website showcases her hand refurbished original furniture, unique consigned pieces, photo galleries of her upholstery work, and glowing testimonials by happy customers. Alissa’s keen intellect and artistic sensibilities are evident throughout the site. We had a ball collaborating, and our WordPress theme developer helped with fabulous personalized modifications – like the testimonials paired with the photos and the strips of fabric across the top of each page. Lastly, the site wouldn’t be what it is without the striking photography by David Gibb. 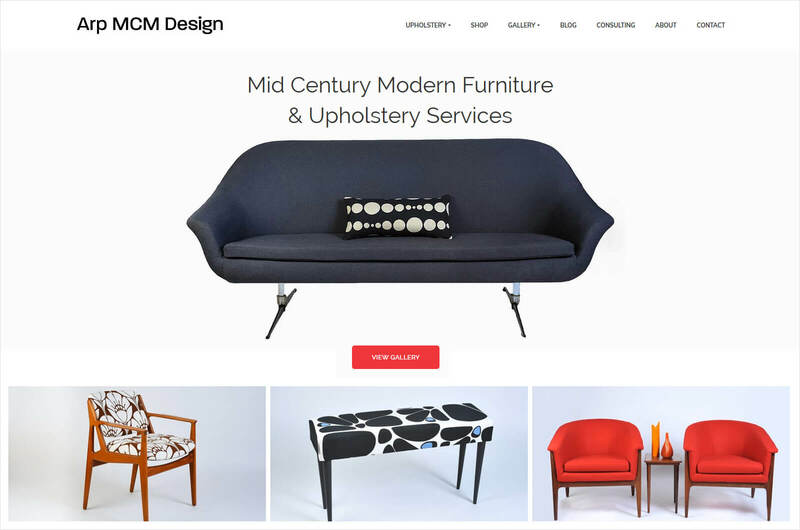 Contact Alissa Arp for mid century modern furniture and upholstery work! Working with Erin was a pleasure, she quickly picked up on my style and taste and created beautiful design choices for my website. I especially appreciated the way she explained the working of the website in just enough detail that I felt confident in my ability to maintain the site, but not overwhelmed with a whole new language and learning curve. An excellent experience and outcome!